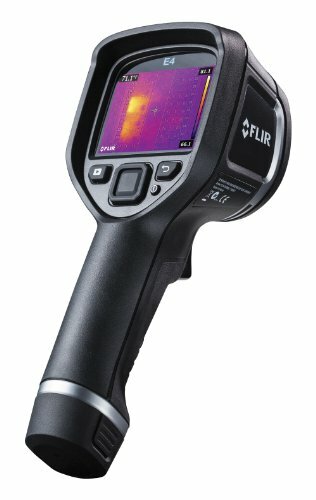 The FLIR E4 Compact Thermal Imaging Camera with 80 x 60 infrared resolution and MSX (Multi-Spectral Digital Imaging) technology provides you with a safe and highly cost-effective means of finding and diagnosing potential problems of an electrical, industrial or mechanical kind. It provides thermal images which clearly reveal issues, from sources of energy loss to leakages, and from structural problems to instances of overheating. . The devise incorporates FLIR’s exclusive and patented MSX technology which can extract vital information from its inbuilt digital camera and then overlays it onto the thermal image, creating a high-resolution radiometric image in real time. MSX is the name of an exciting new feature which produces superior texture in thermal imagery, allowing anomalies to be identified and diagnosed with greater accuracy. . The E4 is the junior member of a family of thermal imaging cameras boasting a progressively increasing resolution, catering for all needs and requirements. With its superior technology and up-to-date applications this camera is an ideal, efficient and economical replacement for traditional infrared thermometers. . This device incorporates an on-board 640 x 480 digital camera and permits simultaneous storage of infrared, visual and MSX images, and it boasts two percent accuracy with temperature range from -4 to 482 degrees Fahrenheit (-20 to 250 degrees Celsius). Its swappable li-ion battery enjoys a full four hours’ life. In addition, a useful 3-inch colour LCD screen enables quick and convenient access to data overlays. This model has a thermal sensitivity of less than 15 degrees Celsius. .
One unique feature shared by all models is the MSX technology exclusive to FLIR which makes for the most incredible thermal imaging detail. Information from the digital camera is embossed onto thermal images in real time, providing total clarity. The MSX system reveals numbers, characters, texture and all other relevant data which circumvents the need to manually compare thermal and digital images in order to identify a problem. Radiometric data is not compromised during this process, whilst more issues can be detected and instant analysis conducted. This unique and superior functionality enables those using this product to get ahead, and to proceed with confidence in their work. .
Whilst focussed on providing an affordable, cost-effective solution there appears to be no desire to compromise on accuracy when it comes to diagnosing electrical, industrial and mechanical issues in a way that ensures that they can be precisely and promptly rectified. 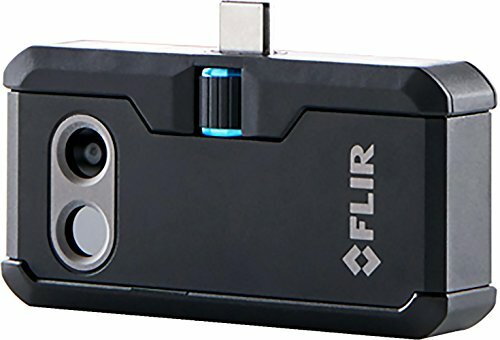 The FLIR Compact Thermal Imagine Camera can confidently be used for the identification of energy loss, intrusion by moisture, overheating and structural issues. .
All models come with a range of accessories including USB cable, power/supply charger, a rechargeable battery and a hard, strong protective case for safe transportation. . Verified customer reviews are overwhelmingly positive, with three out of every four reviewers awarding maximum points to this popular product and most others giving high marks also. .
One consistent theme is the quality of the product when weighted against the low cost. Although there are higher-range models on the market with even greater resolution, this product would appear to seriously outperform the expectations of most users. 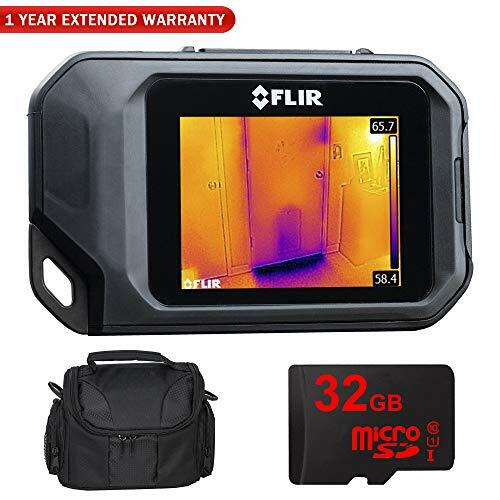 What recurs time and again is the comment that this thermal imaging infrared camera performs a professional job at a highly affordable price. The consensus view is that it is easy to use and instructions are simple to follow. . Criticisms are few and tend to focus upon isolated teething issues, for example one complaint was to do with a faulty USB port. Of course this can be a serious matter if you are unlucky enough to be a customer who is affected by a design flaw, but the product is covered by a generous warranty which adds appropriate protection in such an event. .
Other criticisms include the incompatibility of the device with external lenses, and one commentator pointed out that when out of warranty repairs and parts can be expensive. . Overall the view from users and reviewers is highly positive, and there seems to be more or less universal agreement that this as a product is both affordable and in fact good value for money. The quantity as well of the quality of the reviews provided would suggest that this is a widely-shared view amongst the product’s loyal customer base. . The E4 Thermal Imaging Camera is an extremely cost-effective device for identifying difficulties with plumbing which can sometimes seem invisible to the naked eye. The cheapest model amid a dedicated range of groundbreaking options, the E4 utilises all the most modern and advanced technology to accurately identify the sources of clogged pipework, water leaks, missing insulation, condensation and other regular issues, thereby permitting action to be taken without the need for laborious and unnecessary drilling, probing, or expensive and time-consuming investigation. Specifically, it incorporates state-of-the-art Multi-Spectral Digital Imaging (MSX) technology for stunning resolution. Its practical 3-inch colour LCD touchscreen display allows for easy access to data overlays, whilst a focus-free lens and simple button navigation system makes this an easy appliance for beginners as well as experts to use. It is portable, compact and easy to handle – an ideal replacement for outdated and outmoded traditional infrared thermometers. .
All devices come with an automatic 5-10-2 warranty, providing full coverage on parts and labour for two years and underwriting the battery for five years, and – crucially – the infrared detector itself for a full ten years, bringing you peace of mind when operating the equipment. . The FLIR E4 comes with a robust protective case for safe storage, portability and convenience.